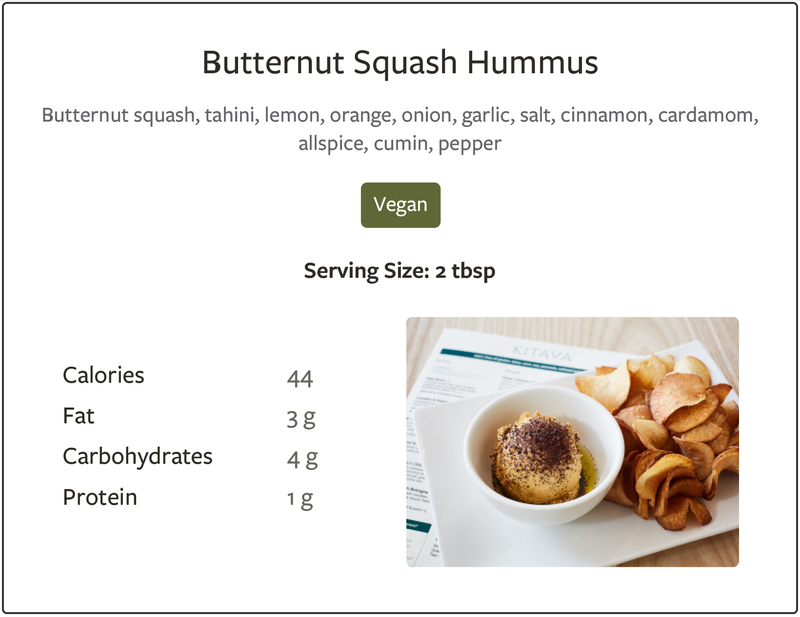 Check out our interview with Bryan to learn more about his value-driven business and get the recipe for one of Kitava’s most popular menu items - Butternut Squash Hummus! When you think about dining out at a restaurant, you probably don’t envision it as a “health” experience. But as we move deeper into the age of technology, information, and wellness, it seems that consumers are more interested and invested in their health and want to know more about their food options and the overall impact that food has on their wellbeing. “Healthy” means something different to every client we serve, so we believe informed choices allow our clients to make the best decisions for their personal health philosophy. This means providing full ingredients lists, sourcing and nutrition information, and striving to work with the best possible restaurants who share our values. Kitava is the gold standard of Zesty restaurants. Kitava’s food philosophy focuses on conscious sourcing, healthy fats, mindful meats, from-scratch cooking, and delicious veggie-forward meals that anyone can enjoy. Bryan Tublin founded Kitava to create a place to nourish the community by celebrating healthful and sustainable food. Zesty: How did you get started in the restaurant industry? Bryan: Prior to starting a catering business, which eventually became Kitava, I hosted a series of pop-up dinners centered around healthy meals and quality social interaction. The goal was to create a healthy alternative to the typical night out, where you didn’t have to question what was in your food, where it comes from, or feel pressured to drink alcohol. I teamed up with friends who had culinary backgrounds to create meals using local and seasonal ingredients, then rented out restaurant spaces for the events. Those pop-ups were really fun, and taught me a lot about the food service industry. The approach also seemed to resonate with people, and that’s when the seed was planted to create a physical space with a similar philosophy, which ultimately evolved into Kitava. Zesty: What inspires you and the food you make? Bryan: Kitava is driven by a desire to help people lead healthy, meaningful lives, and we believe this starts with the food we put into our bodies. That’s why our entire menu is centered around vegetables, humanely-raised meat, and whole, nutrient-dense ingredients. We strive to create meals that are approachable, comforting, and familiar, as well as nutritious, since you shouldn’t have to compromise your health to eat well. Zesty: What is your signature (or favorite) dish? Bryan:My favorite dish at Kitava is our Meatloaf and Sweet Potato Mash. It’s familiar, comforting, and delicious, with a healthy twist that doesn’t leave you feeling lethargic. The grain-free meatloaf features 100% grass-fed beef, and we use mushrooms and pasture-raised eggs as the binder. The meat is paired with a hearty portion of garlic mashed sweet potatoes, roasted carrots and broccoli, and topped with a house-made chicken bone broth gravy. It’s classic American comfort food, but without the guilt! Zesty: What is the most rewarding aspect of working in the food industry? Bryan: The opportunity to create community is the most rewarding aspect of working in the food industry. Food is the perfect vehicle to bring people together in a very real way. We’re so connected to our devices these days that we sometimes forget how important real social interactions are for our wellbeing. Fostering that type of meaningful connection in a restaurant environment is what makes all the hard work worth it. Zesty: What is your personal health philosophy? Bryan: Achieving true health is about more than following a specific diet, or being super fit. Eating right and staying active are important, but health also extends to how we feel mentally and emotionally. That’s why being involved in a restaurant is so cool. The menu can promote quality nutrition, while the atmosphere, staff, and service can offer a comforting, stress-free experience. Personally, I feel the healthiest when I’m eating nutritious food, working out regularly, getting quality sleep, and taking time to socialize with friends and family. Zesty: Anything else you’d like to add? Bryan: Eating in a way that supports your health doesn’t have to be difficult or complicated. Focus on vegetables, healthy fats, and ingredients you recognize; avoid processed food that comes in a package; and take time to savor your meals, ideally with people you enjoy spending time with. Roast butternut squash with olive oil, salt, and pepper. Cook until golden brown, then scoop seeds out while the squash is still warm. Let cool. Once squash is cool, blend remaining ingredients in a Vitamix or with a stick blender to desired consistency. Sprinkle with sumac and drizzle with extra virgin olive oil to garnish.